STOP! Read the following before making your purchase of package bees: Cancellation Notice [Store Policy], Shipping Dates, Shipping Date Changes, Shipping Locations, Shipping Expenses, and Shipping Notices. Shipping Dates: Every season the demand for packages of bees continues beyond our normal shipping season. The posted shipping dates quickly sell out, especially premium shipping dates. We try to accommodate demand by adding more dates near the end of the season. But as the temperatures begin to soar after mid April, our shipping dates and policies become more stringent. Any package of bees purchased for a ship date after April 21 will not be replaced nor refunded if it dies during transit. Neither will any of the other itemized cost on the bill of sale be reimbursed. It is highly recommended that before you purchase that you analyze your local weather to determine the best possible ship week. The ship date you select is a range of possible ship dates....not arrival dates. Typically, we ship on Tuesdays, Wednesdays, and Thursdays. We only ship our bees via UPS next day air. Therefore, your packages are likely to arrive on a Wednesday, Thursday, or a Friday. The night we ship your packages an email notice will be sent to with a tracking number to the email you provide. Read more about shipping notices for more details. Please make sure, before you place your order, that you or someone you know can accept the package from UPS upon it's delivery. Shipping Date Changes: If you need to change a shipping date, a request must be made at least one week before it's ordered ship date and on our change request form. We will do our best to make your requested change to an agreeable date. 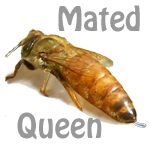 Shipping Locations: To give your package bees the best chance of safe arrival, we recommend that you have them shipped to a location near you that has the earliest possible delivery in the day. This will reduce their risk to heat exposure during shipment. Example Location: Your local UPS Distribution Center. We don't ship package bees outside the United States or to the state of Hawaii. Shipping Expense: Read your order details carefully before completing your order. Double check the total on your order including shipping costs before submitting your payment. All packages will only be shipped via UPS Next Day Air. The pricing on the packages listed below does not include shipping. The shipping charges are calculated based on your "ship to" location which you provide in the ordering process. If ordering on a smart phone, your screen may go transparent black on check out due to a pop up notification. Hit the enter button to clear out the notification. 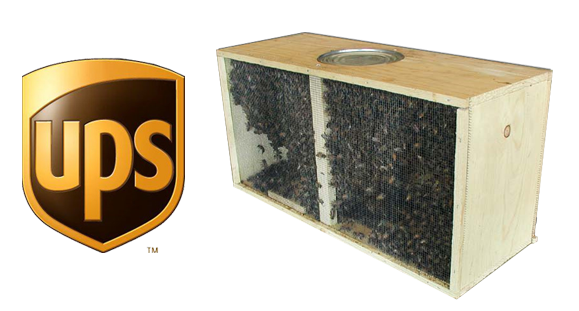 Shipping Notice: We will email you the UPS tracking number late in the evening that the bees ship. Since we hold onto the bees up to 7pm California time the notices will not be availble early on their ship day. All notices will be posted prior to midnight California time on the night they leave. Please check your email frequently on your possible ship dates. If you are interested in getting an idea what it cost to ship "UPS Next Day Air" to your location before you start your order, then Click Here. I am very happy with the Bees that I recived they where in great shape and as best I can tell there where none lost in shipping. I will order again from you. ONLY way to ship bees!